The songs of Sting will be used in a new dance show which will premiere at the Peacock Theatre, London, in February 2020. Message In A Bottle will be choreographed by triple Olivier Award nominee Kate Prince and feature a mix of dance styles and athleticism. The show will see a village which was once alive with celebration now under siege. Three parted siblings step out on their own adventures. Using some of Sting’s greatest songs such as ‘Roxanne’, ‘Englishman In New York’, and ‘Every Breath You Take’, this exhilarating show will tell an uplifting and vital story of hope and humanity. Kate Prince is the artistic director of dance company ZooNation, who have created some of the most popular hip hop dance shows of recent years such as Into the Hoods and Some Like it Hip Hop. Prince has also worked on numerous theatre shows including Everybody’s Talking About Jamie and SYLVIA, the latter of which she wrote the book for. Prince is also an associate director of the Old Vic and Sadler’s Wells. The cast for Message In A Bottle is yet to be announced. The show will include members of ZooNation, as well as additional cast members who will be found after national auditions. 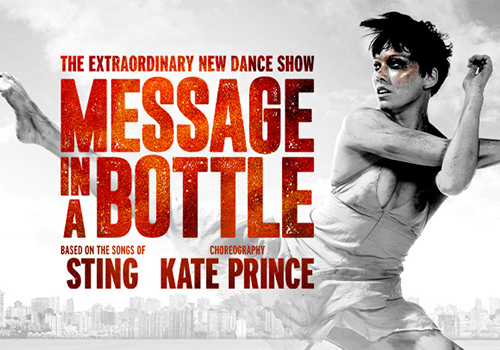 Message in a Bottle is suitable for all ages, and especially for fans of Sting.